United Launch Alliance’s Atlas V rocket has deployed an advanced weather satellite for the US National Oceanic and Atmospheric Administration Thursday. The mission to deploy the GOES-S satellite began with liftoff from the Cape Canaveral Air Force Station at the opening of a two-hour window at 17:02 Eastern Time (22:02 UTC). GOES-S is the second of four satellites making up the fifth generation of the Geostationary Operational Environmental Satellite (GOES) program, a series of spacecraft that the National Oceanic and Atmospheric Administration (NOAA) uses to provide continuous monitoring of weather conditions in the United States and across the western hemisphere. At any time, the GOES constellation consists of two operational satellites in geostationary orbit, plus a number of spares. GOES complements NOAA’s polar orbit satellites – such as the JPSS-1 satellite (since renamed NOAA-20) that launched last November. The Polar orbit satellites make brief passes over much of the Earth’s surface, while from their geostationary orbits high above the equator, GOES spacecraft constantly observe the same disc of the planet. The two operational satellites are stationed at 75 and 137 degrees West – slots designated GOES-EAST and GOES-WEST respectively. The satellite occupying GOES-EAST is responsible for monitoring the eastern United States, the Atlantic Ocean, Caribbean and the Gulf of Mexico. GOES-WEST covers the western regions of the continental United States, Alaska and Hawaii and the Pacific Ocean. GOES-S, which will be renamed GOES 17 after it reaches geostationary orbit, is expected to replace the eight-year-old GOES 15 in the GOES-WEST slot towards the end of this year. Before beginning the GOES program, NOAA operated a pair of experimental geostationary weather satellites – named Synchronous Meteorological Satellites (SMS). SMS-1 was launched by a Delta 2914 rocket in May 1974, with SMS-2 following in February 1975. Following their success, three operational GOES spacecraft were built based on the same design. These were launched between October 1975 and June 1978. A second generation of satellites – consisting of five satellites – were launched between 1980 and 1987. The fourth second-generation satellite, GOES-G, was lost in a May 1986 launch failure. The first and second-generation spacecraft employed spin-stabilization and were equipped with spin-scan radiometers to image a strip of the Earth as its host satellite rotated. From its third generation onwards, GOES has employed three-axis stabilization. The first of five third-generation satellites – GOES 8 or GOES-I – was launched aboard an Atlas I rocket in April 1994. The last – GOES 12 or GOES-M, was deployed by an Atlas IIA in July 2001. All of the first, second and third-generation GOES satellites have now been retired. Of the four GOES satellites currently in service the oldest is GOES 13, which was launched as GOES-N in May 2006. It was the first of three satellites in the system’s fourth generation, all of which remain in operation. GOES-13 is currently being kept over the East Coast as a backup to GOES 16, which replaced it in the GOES-EAST slot on 18 December last year. The other two fourth-generation spacecraft are GOES 14 and GOES 15 – launched as GOES-O and GOES-P in 2009 and 2010 respectively. GOES 14 is a dedicated backup for the constellation, positioned at 105 degrees west and configured for long-term on-orbit storage. The GOES 14 spacecraft has been activated several times after GOES 13 suffered malfunctions and is kept ready to move to either operational slot should another satellite fail. 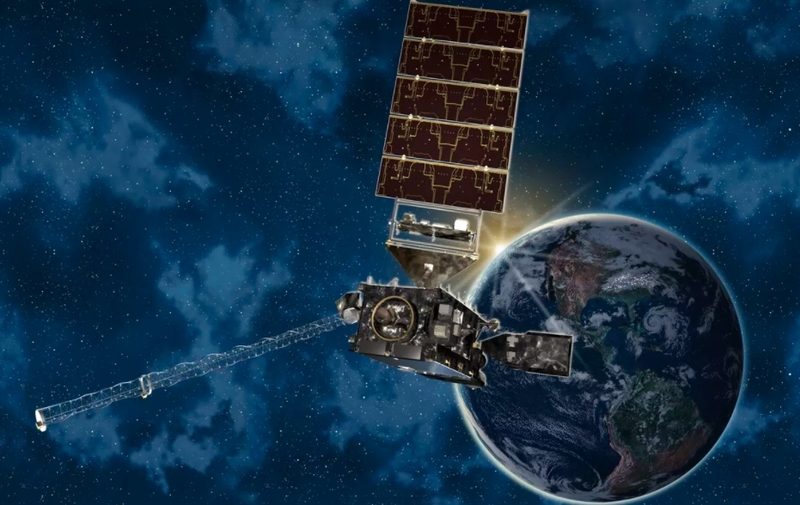 GOES 15 has been the operational GOES-WEST satellite since June 2011 – it is due to be replaced later this year with the GOES-S satellite that is being deployed by Thursday’s launch. GOES 16 has now been operational at GOES-EAST for two and a half months. The first fifth-generation satellite, it is of the same design as GOES-S and was deployed by an Atlas V 541 rocket in November 2016. Before launch it was designated GOES-R, and the fifth-generation satellites are collectively known as the GOES-R series. The new satellites collect more data at a higher resolution and shorter sampling intervals than their predecessors. The GOES-R-class satellites are being built by Lockheed Martin. They are based on the A2100A satellite bus and each has a mass at launch of 5,192 kilograms (11,466 lb) with dimensions of 6.1 by 5.6 by 3.9 meters (20 by 18 by 13 feet). The satellites are designed to operate in orbit for fifteen years: consisting of five years’ on-orbit storage and ten years of weather monitoring. 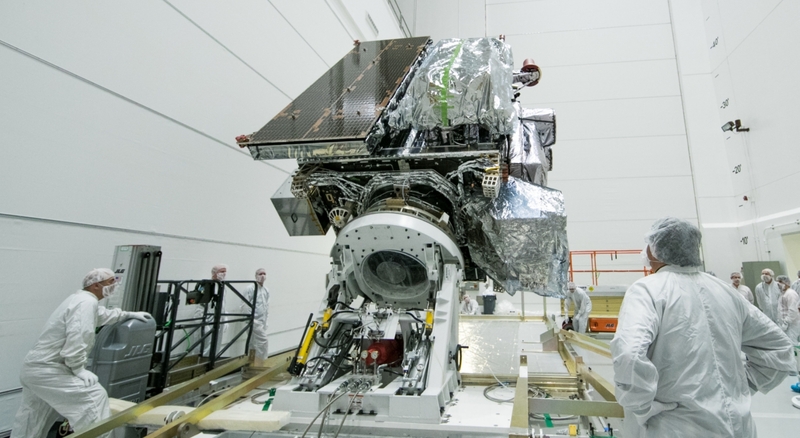 GOES-S is equipped with a LEROS-1C liquid apogee motor, which will be used following launch to raise the satellite into its final geostationary orbit. Electrical power is generated through a single five-panel solar array that will provide over four kilowatts for the satellite’s systems and instruments. Two further satellites of the GOES-R class – GOES-T and GOES-U – are expected to be launched in 2020 and 2022. GOES-S carries a suite of six scientific instruments and is also equipped with a data relay payload. The satellite’s main instrument is the Advanced Baseline Imager (ABI), which is mounted on its nadir – Earth-facing – side. ABI can produce images of the Earth in sixteen different spectral bands, covering visible light through to infrared. At a visible-light wavelength of 0.64 nanometres, ABI can achieve an imaging resolution of 500 meters (547 yards), while in the infrared it can image at a resolution of up to 2,000 meters (2,187 yards). This is twice the resolution provided by the imager aboard the GOES 15 satellite that GOES-S will replace. The imager can be operated in full-disc, regional and mesoscale modes. In normal operation it will produce four full-disc images of whole visible face of the Earth, twelve regional scans of the United States and 120 mesoscale images – each covering an area of one million square kilometers (390,000 square miles) – per hour. An alternative mode of operation allows the satellite to produce full-disc images exclusively, outputting a new image every five minutes. A second Earth-facing payload, the Geostationary Lightning Mapper (GLM), will monitor the Earth for sudden visual events in order to help build a map of lightning activity. GLM was first flown aboard GOES 16, and the instrument aboard GOES-S will help to provide similar data for the western United States to that now available for the eastern states. By monitoring lightning, GOES satellites will help forecasters predict storms, provide warnings of severe weather, and determine whether ongoing storms are increasing or decreasing in strength. In the west, this data will also help firefighters to identify lightning strikes that may cause wildfires. As well as monitoring the Earth’s weather, GOES-S will perform solar observations to help forecast space weather. Its Solar Ultraviolet Imager (SUVI) and Extreme Ultraviolet and X-Ray Irradiance Sensors (EXIS) are mounted on the sun-tracking arm that connects the satellite’s solar array to its body. This affords them a near-continuous view of the sun as the solar array tracks it across the sky. SUVI operates in the extreme ultraviolet, capturing full-disc images of the sun that can be used to monitor eruptions, solar flares and changes on the solar surface. EXIS, which consists of the Extreme Ultraviolet Sensor (EUVS) and X-Ray Sensor (XRS), monitors specific spectral bands in light coming from the Sun. EUVS looks for variations in emission lines from helium, hydrogen and magnesium, that can be used to characterize emissions from different parts of the sun and to model its ultraviolet spectrum as a whole. XRS helps to characterize solar flares and measure the sun’s irradiance. The Space Environment In-Situ Suite (SEISS) will be used to take readings of the immediate space environment in which GOES-S will operate. it consists of five sensors: the Energetic Heavy Ion Sensor (EHIS), two Magnetic Particle Sensors (MPS-Hi and MPS-Lo), two Solar and Galactic Proton Sensors (SGPS) and a boom-mounted magnetometer. EHIS will be used to measure the flux of heavier ions trapped in Earth’s magnetosphere or incoming from extraterrestrial sources. The Magnetic Particle Sensors will measure the flux of protons and electrons: MPS-Hi will monitor higher-energy particles and MPS-Lo will measure lower-energy particles. The two identical SGPS sensors will measure protons incident from the sun and from outside the solar system. GOES-S will also be used as a relay satellite through its Unique Payload Services (UPS) suite which will support four communications applications. GOES Rebroadcast (GRB) allows compatible receivers to download the latest observational data directly from the satellite, without waiting for the NOAA to publish it. The Data Collection System (DCS) is used to relay data from remote unmanned research stations back to the NOAA. The Emergency Managers Weather Information Network (EMWIN) is used to provide forecasts and other data to support emergency response and management. Through their communications payloads, the GOES spacecraft also support the international COSPAS-SARSAT search and rescue program. GOES satellites can pick up distress signals from ships, aircraft and personal locator beacons (PLBs) and relay them to a control center from where rescue operations can be coordinated. GOES-S was launched by United Launch Alliance (ULA), who used an Atlas V rocket to place the satellite into geostationary transfer orbit. 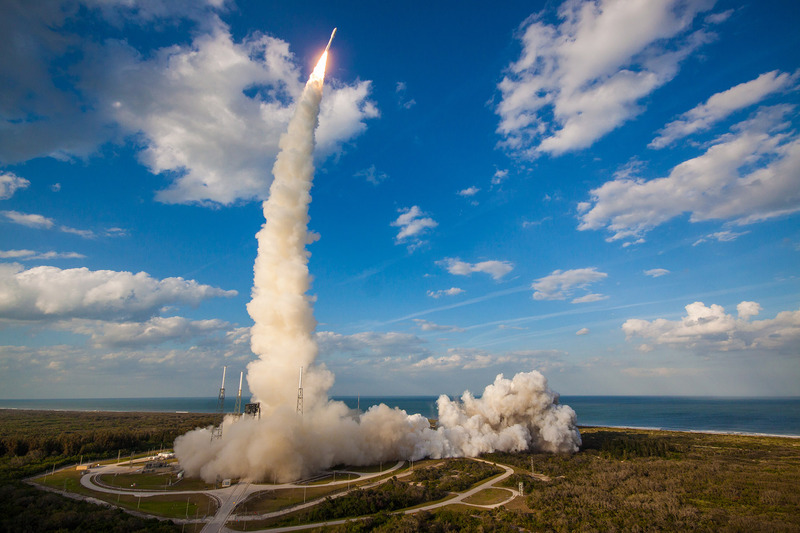 Formed in December 2006 when Boeing and Lockheed Martin merged their rocket divisions, ULA builds and operates the Atlas and Delta families of rockets, providing launch services to US government and commercial customers. Originally the company was only contracted directly for government missions, with Boeing and Lockheed Martin retaining responsibility for commercial Delta and Atlas missions respectively – which would be subcontracted to ULA. In January, United Launch Alliance announced that it would take over responsibility for commercial Atlas launches from Lockheed Martin. Both of the company’s Delta rockets are being phased out and are no longer offered for commercial missions. Atlas V, which was originally developed by Lockheed Martin, is a two-stage rocket. First flown in August 2002, Atlas has completed seventy-five missions prior to Thursday’s launch, with the only blemish on its record a partial failure on its tenth flight – in June 2007 – which left a pair of National Reconnaissance Office signals intelligence satellites in a slightly off-target orbit. The satellites were able to reach their planned orbit under their own power. 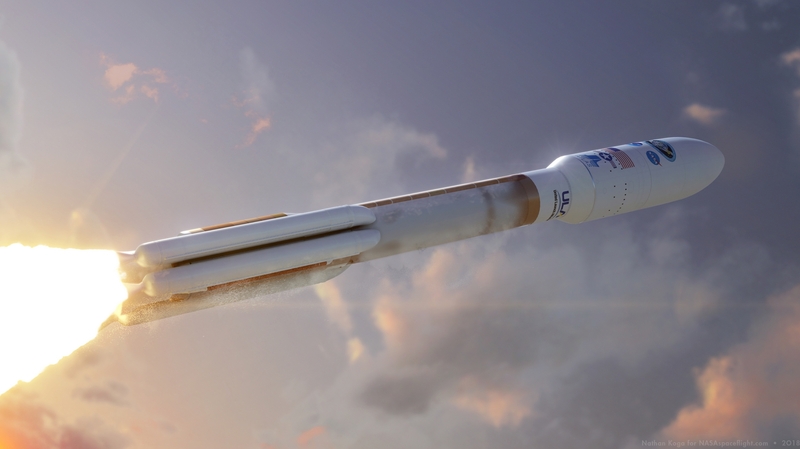 Atlas consists of two liquid-fuelled stages, with optional solid rocket motors attached to the first stage which can provide additional thrust during the early stages of flight. The rocket can fly in several different configurations, varying the number of solid rocket motors between zero and five, using a single or dual-engine second stage and a payload fairing with a diameter of four or five meters (13 or 16 feet). This allows it to cater to different mission requirements in terms of payload mass, volume and target orbit. For Thursday’s launch, Atlas flew in the 541 configuration, which uses a five-meter payload fairing, four solid rocket motors and a single-engine Centaur upper stage. The five-meter fairing, which is built by Swiss firm RUAG, encloses both the GOES-S satellite and the Centaur stage, protecting them from the atmosphere as Atlas climbs towards space. The Atlas V that performed Thursday’s launch has tail number AV-077. It launched from Space Launch Complex 41 (SLC-41) at the Cape Canaveral Air Force Station. SLC-41 – or LC-41 as it was designated prior to 1997 – was built in the 1960s as part of the two-pad Integrate-Transfer-Launch (ITL) complex, designed to streamline Titan III launch operations. The ITL complex also included Launch Complex 40 – which is now used by SpaceX – and a vertical integration building which has since been demolished. SLC-41 was used by Titan rockets between 1975 and 1998 – with Titan IIIC, Titan IIIE, Titan IVA and Titan IVB rockets lifting off from the launch complex. NASA’s Viking missions to Mars and Voyager missions to the outer planets were launched aboard Titan IIIE rockets from LC-41 in the 1970s. After supporting its last Titan launch, the fixed and mobile service towers at SLC-41 were demolished to make way for the clean-pad approach that Lockheed Martin planned to use with the Atlas V – although the pad’s Titan-era lightning towers were retained. Rockets are fully assembled in the Vertical Integration Facility (VIF), 550 meters (1,800 feet) south of the pad and moved into position atop a mobile launch platform. Ahead of Thursday’s launch, Atlas was transported to the launch complex on Wednesday. 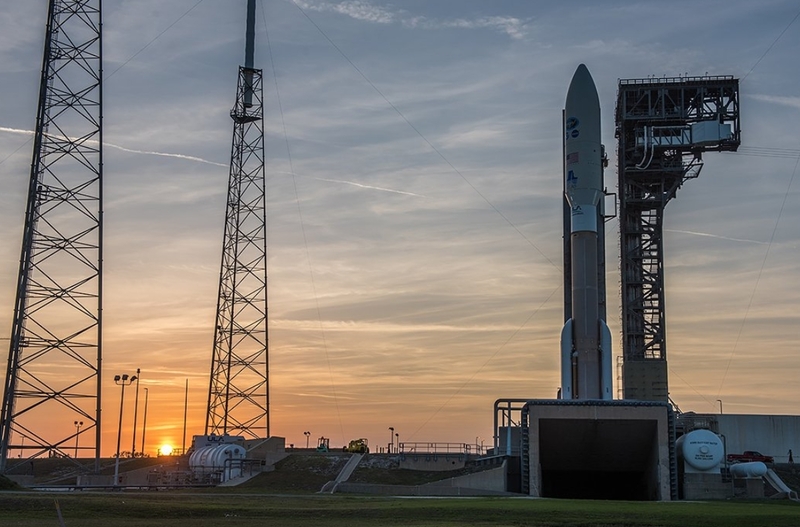 During Thursday’s countdown, Atlas was fuelled, checked-out and made ready to launch. The rocket’s first stage, or Common Core Booster (CCB), is powered by a single RD-180 engine which ignited 2.7 seconds before the countdown reached zero. Ignition of the four Aerojet AJ-60A solid rocket motors occurred at liftoff, which took place at about T+1.1 seconds. The vehicle began a series of pitch and yaw maneuvers 4.1 seconds later, placing it onto the planned course for its ascent to orbit. Under the power of its main engine and four solid rocket boosters, AV-077 climbed quickly away from Cape Canaveral, reaching Mach 1 – the speed of sound – 35.2 seconds after liftoff. The rocket passed through Max-Q, the area of maximum dynamic pressure, 47.1 seconds into flight. The solid rocket motors burned out around 98 seconds into the mission. Their spent casings were jettisoned at the 110.3-second mark in the flight. With the AJ-60s gone, the CCB’s RD-180 engine continued to burn as AV-077 climbed out of the atmosphere. The RD-180 burns RP-1 kerosene propellant, oxidized by liquid oxygen. Once Atlas reached space, the payload fairing was no longer needed to protect its payload and was discarded to reduce the vehicle’s weight. The fairing separated about three minutes, 29.9 seconds after launch. Shortly afterward the Forward Load Reactor (FLR), which attaches to the rocket’s upper stage to help increase the rigidity of the fairing, was also separate. The Atlas booster exhausted its fuel and ended its burn four minutes and 21.9 seconds after lifting off. This event, designated Booster Engine Cutoff (BECO), was followed by stage separation six seconds later. Atlas’ second stage, a single-engine Centaur (SEC), ignited its RL10C-1 engine ten seconds after separation. Centaur, which traces its heritage back to the early 1960s, is a cryogenically-fuelled stage burning liquid hydrogen propellant and liquid oxygen. During Thursday’s launch, it made three burns. Centaur’s initial burn lasted seven minutes and 33.8 seconds, placing itself into a parking orbit. Restarting after a ten-minute, 26.7-second coast as it crosses the equator, the stage fired for a further five minutes and 30.9 seconds to reach geosynchronous transfer orbit. The third and final burn lasted 94.4 seconds, beginning after an almost-three-hour coast phase at three hours, 28 minutes and 7.9 seconds mission elapsed time. This raised the perigee and lower the inclination of the rocket’s orbit, reducing the amount of fuel that GOES-S will need to expend raising itself into geostationary orbit. GOES-S separated from AV-077 about two minutes and 49 seconds after the third burn ends. The target orbit for spacecraft separation is 8,215.47 by 35,286.67 kilometers (5,104.86 by 21,926.12 miles, 4,436.00 by 19,053.28 nautical miles) at an inclination of 9.52 degrees and with an argument of perigee of 179.69 degrees. About 26 minutes and 20 seconds after deploying GOES-S, Centaur began a blowdown to safe itself, before the expected end of mission, at four hours, 32 minutes and 11.3 seconds after liftoff – twenty seconds shy of an hour after spacecraft separation. Thursday’s launch was the second of the year for the Atlas V rocket, following January’s successful deployment of the SBIRS GEO-4 missile detection satellite. The next Atlas launch is currently scheduled for 12 April, with an Atlas V 551 carrying out the AFSPC-11 mission for the US Air Force. 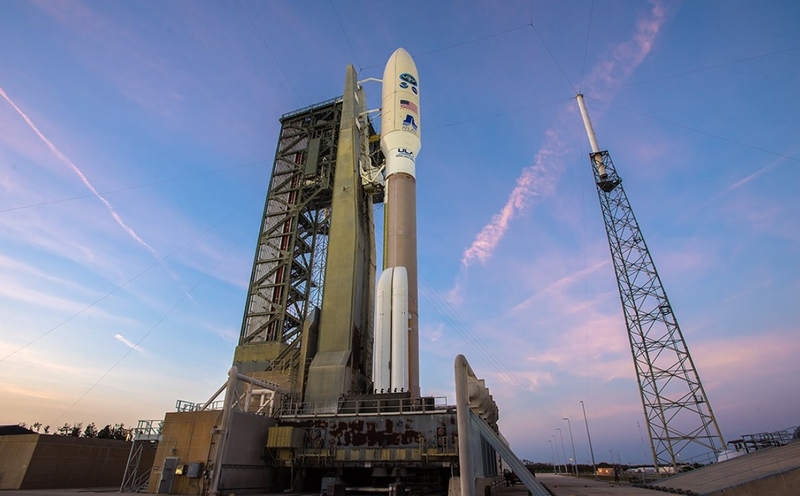 NOAA’s next GOES satellite, GOES-T, is slated for launch around September 2020. However, a launch contract has not yet been announced.